Courchevel is the most famous ski resort of Les Trois Vallées Ski Region – which is the biggest ski region on the globe. Courchevel itself is comprised of four French ski villages, Le Praz 1300 – the charming Savoyard village, the family-friendly Courchevel 1550 and 1650 (denoting their elevation in meters), and Courchevel 1850 – the highest and most upscale ski resort. Families will love Courchevel’s alpine ambiance, the Family Fun Zones on the ski slopes, the excellent ski school with over 1000 ski instructors is home to the largest kids ski village – Dragoval is medieval themed and super cool fro kids. Après ski at Courchevel, there plenty to do – like sledding, shopping the pretty village, exploring Aquamotion – the indoor waterpark with slides, swimming, rock climbing and so much more. The skiing of Courchevel is vast with ski terrain spanning from Le Praz 1300 where the Olympic Nordic ski jumps are located, to the authentic family-friendly villages of Courchevel 1550 and 1650 to Courchevel 1850. All the Courchevel slopeside towns are interconnect gondolas, chairs, pomas and a few cable cars (trams). Of Les Trois Vallées huge terrain, Courchevel offers some of the most varied skiing, beautiful groomed trails, some gladed tree skiing, and some high alpine snow bowls at Saulires -the highest point reached by cable car at 8,982′. From here you can ski toward to neighboring Meribel and Val Thorens – all part of your 3 Valleys lift ticket. Courchevel’s skiing is mostly between 2738-1800 meters, assuring good snow, and Courchevel has over 600 snow guns to promise snow too. While Courchevel’s off-piste terrain and wide open bowl skiing isn’t huge as nearby Val Thorens, it has a great atmosphere, long trails, fun tree skiing and snowy meadows, with – of course – spectacular views of Mont Blanc, nearby Tignes, and the French Alps. 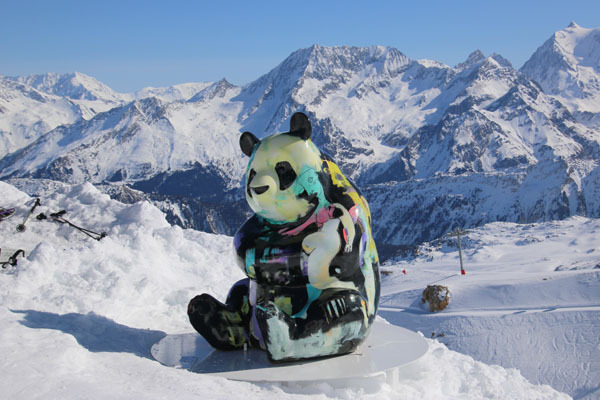 Kids will like Courchevel’s Fun Parks, the Panda Bears around the mountain, and the BMW timed race course. Beautiful big mountain chalets dot the slopes for upscale ski lunches, perfect if your kids are in all day ski school, or if you want to start your après ski before you finish skiing. We recommend Chalet de Pierres where waiters wear traditional French berets, Soucoupe – where meats are grilled on an open fireplace, and La Cave des Creux for its fantastic sun terrace and a decadent dessert display, and the more casual but pleasant Bel Air. See the Best On Mountain Restaurants in Les 3 Vallées review. 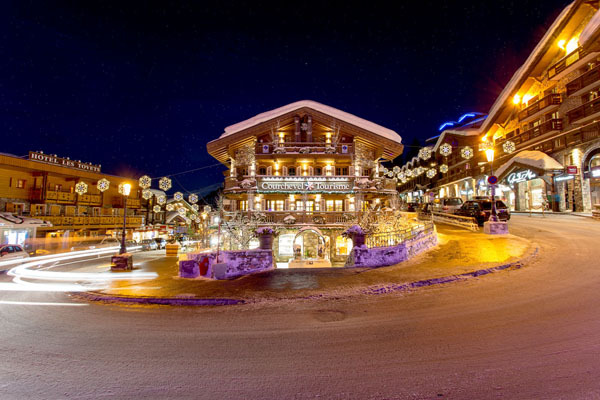 Courchevel 1850 village is perfect since it was a designated ski village in 1946 – custom designed- you will find it very walkable and charming. Here you will find sophisticated shopping, upscale dining, and top ski lodging. See our Reviews of the Best Ski Hotels in Courchevel. It’s a pretty snow globe of sparkling lights and snow caked chalets in winter. Wednesday evening Courchevel’s ski slopes are lit for night skiing 6-8 with a DJ playing, and most every week is a festival of some sort. Fun things to do as a family in Courchevel besides skiing the vast terrain include sledding on The Luge – a 2.5- kilometer sled run in the forest, getting wet and wild at Aquamotion – the largest water park in all of Europe, and visiting the Olympic Forum in nearby Albertville in 1992, which now offers an ice skate rink, bowling, and a climbing wall. Mountain Lodging in Courchevel is top notch, with many 5-star hotels, we love Courchevel Aman Le Melezin, plus a few 5-star palace properties – ski-in ski-out and trés luxe. A family ski holiday at Courchevel is fun, friendly, with fine kids programs, fantastic French food and lodging and fabulous skiing…its definitely among our Top French Family Ski Resort – so French.